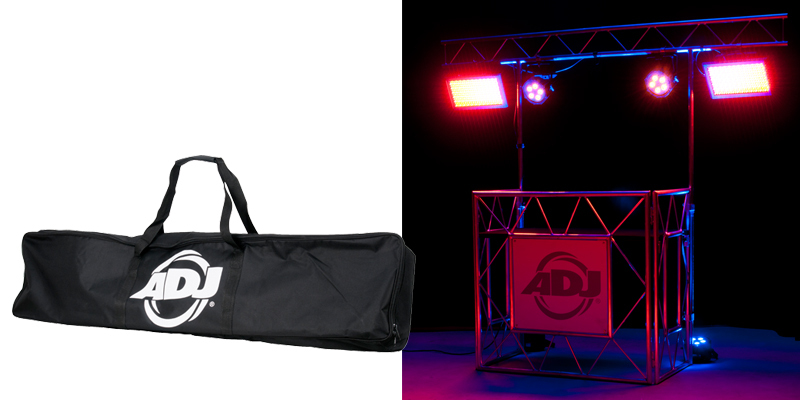 The ADJ Pro Event IBeam is an innovative new accessory that allows an aesthetically pleasing and robustly practical lighting goalpost to be easily added to any ADJ Pro Event Table or Pro Event Table II. This provides an overhead truss that can be used to mount a wide variety of lighting fixtures, effects and accessories, transforming the Pro Event Table into a complete audio/visual control station that is ideal for mobile entertainers as well as other sound and lighting professionals. 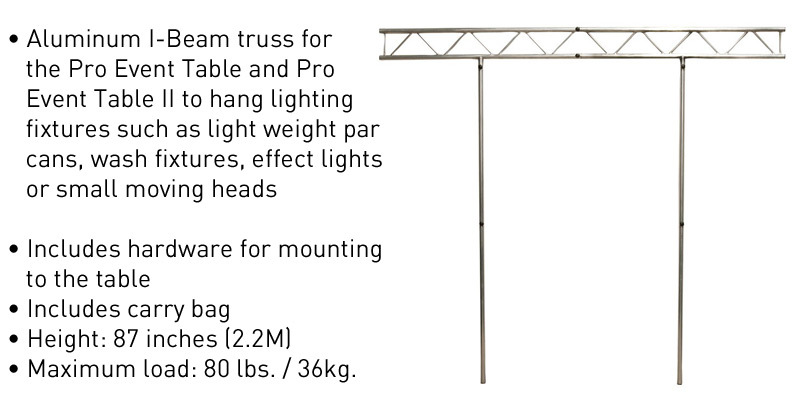 With a polished metallic finish that matches the Pro Event Table range, the Pro Event IBeam consists of two connecting overhead truss sections as well as two supporting beams (each of which also break down into two separate sections for transportation). The kit is provided with a convenient carry bag as well as all of the hardware needed for securing the frame to a Pro Event Table. The Pro Event IBeam kit is compatible with the original Pro Event Table as well as the newly updated Pro Event Table II model. Launched at the end of last year, the new Pro Event Table II builds on the success of the original Pro Event Table, but with an improved design that makes it even more portable and flexible. The first Pro Event Table model featured a single solid front section, with two folding side pieces, which meant that the folded unit had a large surface area. This required a relatively large vehicle for transportation and a sizeable space for storage. The new Pro Event Table II features two linking front sections, which can be separated to halve the folded size of the unit allowing it to fit into smaller vehicles and storage spaces. Weighing in at around 40 lbs. (18kg.) and with a clean, modern look, the Pro Event Table II is the ideal portable equipment stand for DJs, entertainers and AV professionals. Now, coupled with the new Pro Event IBeam, it can also become a free-standing lighting rig. Once erected and secured to a Pro Event Table, the Pro Event IBeam has a height of 87 inches (2.2M) while it’s truss extends across a width of 98 inches (2.5M). It can safely support a maximum load of 80 lbs. / 36 kg. (evenly distributed), with fixtures attached using Global Truss America Junior Clamps (sold separately). This makes it suitable for use with most par cans, wash fixtures, effect lights and smaller moving heads. As lighting technology continues to advance, the weight of modern fixtures is constantly dropping. This means that an extremely impressive lightshow can be created without exceeding the 100 lbs. limit. For example, the Pro Event IBeam could comfortably support the weight of ten ADJ Pocket Pro moving head fixtures or six of ADJ’s new Boom Box FX3 multiple effect units. With a weight of just 16 lbs. / 7kg. and collapsed dimensions of 52" x 11.5" x 4.25" / 1320x 290 x 110mm (L x W x H), the Pro Event IBeam is extremely convenient to carry, store and transport. It is constructed from lightweight, yet durable, aluminum and has a carefully-developed design that means setting up and dismantling the kit is an easy task that takes only a matter of minutes. ADJ’s original Pro Event Table and new Pro Event Table II offer a compact and collapsible professional alternative to folding banquet tables or piles of road cases. They provide a convenient surface for control equipment while also offering a modern clean look that is easily brandable. Now, with the addition of ADJ’s new Pro Event IBeam, these portable event tables can be upgraded with an overhead lighting truss to provide a complete mobile event rig that looks great and is easy to transport and assemble.